In the history of Go in Japan, the Four Go houses were the four academies of Go instituted, supported, and controlled by the state, at the beginning of the Tokugawa shogunate. At roughly the same time shogi was organised into three houses. Here "house" implies institution run on the recognised lines of the iemoto system common in all Japanese traditional arts. In particular the house head had, in three of the four cases, a name handed down: Inoue Inseki, Yasui Senkaku, Hayashi Monnyu. References to these names therefore mean to the contemporary head of house. The four academies were the Honinbo Go house, Hayashi Go house, Inoue Go house and Yasui house. Theoretically these were on a par, and competed in the official castle games called oshirogo. This maki-e Go board is at the temple named Ryōgen'in 龍源院 at Daitoku-ji, Kyoto, Japan. It was said to be used by Toyotomi Hideyoshi and Tokugawa Ieyasu. The bowls to the left and right of the board bear their family crests. The first of the four houses was the house Honinbo, founded by Honinbo Sansa. Honinbo Sansa was a buddhist monk, and had been appointed Godokoro (minister of Go) by Tokugawa Ieyasu after the unification of Japan in 1603. They were also nominally Buddhist institutions, with the Honinbo and Hayashi aligned with the Nichiren sect, and the Inoue and Yasui with the Jodo Shu. All players were therefore male. Some outward forms only persisted of that connection, with the oshirogo games being played in Buddhist dress and with shaven heads; the stylish Ota Yuzo was given a waiver of the obligation since he was proud of his hair. After Honinbo Doetsu made a representation that long sleeves were troublesome for the players, a dispensation for shorter sleeves was allowed to them. At least in theory, matters on succession in the houses was subject to the authority of the jisha bugyo, an official regulating religious establishments. Nominations as heir, typically within the iemoto system of the best disciple, who might not be a natural son but in effect adopted, were supposed to be made official. Deaths at an early age particularly affected the Honinbo house, and irregular succession could occur with potential for scandal. The official posts of Meijin and godokoro were awarded, somewhat sporadically, and brought great prestige to the house. In practice backstairs intrigue was often brought to bear on the appointments. 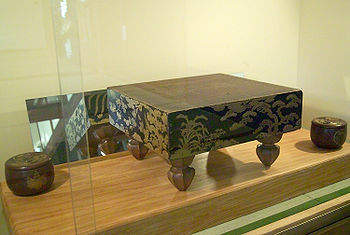 More creditably, since the Meijin title could only be awarded to the undisputed master player of the time, there were occasions when it was withheld from two candidates whose merit was very close (an example was Genjo and Chitoku, around 1810-1820). The mode of teaching, by apprenticeship, brought a consistent and high level of play (though some say the standard sagged in the eighteenth century). Esoteric teaching was normal, with collections of very difficult tsumego being compiled, one of which, the Igo Hatsuryon, is still used for professional training. Prepared variations were used in top games (notably in the blood-vomiting game of Jowa and Akaboshi). Go secrets were state secrets, in effect; since the country was closed to foreigners, in the main, the only international competition was against players from the Ryukyu Islands, but those games are still cited as examples of the difference between strong amateurs and extremely strong players. After a while the Honinbo house (of Dosaku) emerged as most prestigious, and the Hayashi house ran into difficulties, eventually being taken over by the Honinbo. The Meiji Restoration threw the system into disarray, but three houses survived some hard times to 1900. Honinbo Shusai arranged that the Honinbo title should become a tournament of the Nihon Kiin after his death (1939). The Yasui house died out; it is not certain as of 2004 whether the Inoue house theoretically continues or not, though it dropped out of the mainstream from the 1920s.